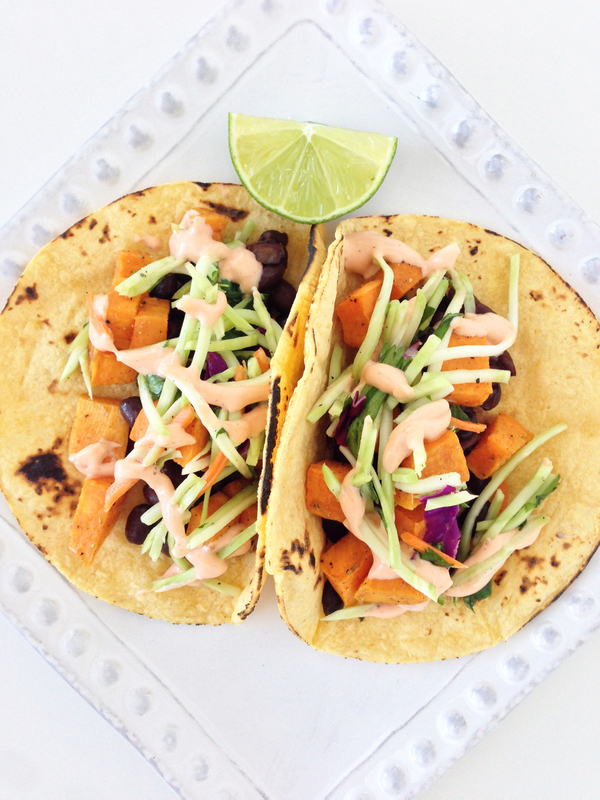 These tacos are an absolutely perfect meal for the end of summer and the beginning of fall. There's a little bit of sweet, a little bit of heat, and even some crunch in there! For about a year now, I've been working really hard to have at least one, and usually more like two, vegetarian dishes for dinner every week. We definitely don't eat red meat more than once in seven days and clean eating is something Im striving towards. Sometimes it's the most simplest of things that bring the biggest of smiles to our faces. 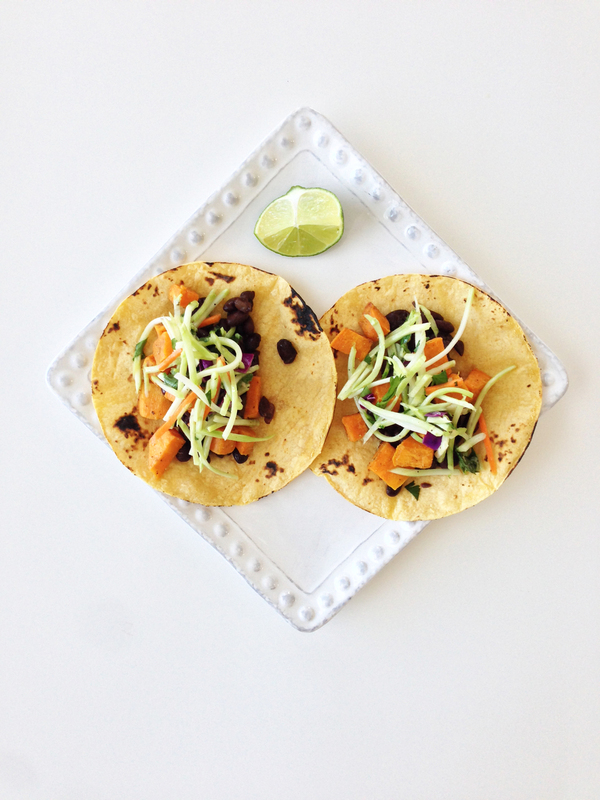 These tacos contain about 10 ingredients said-and-done (not including the salt & pepper) and yet are absolutely bursting with flavor. Don't get me wrong, the individual components would be bland alone, but together? ... It's wondrous. There are three things needed to put these tacos together... The filling, the slaw, and the crema. They are each super easy! 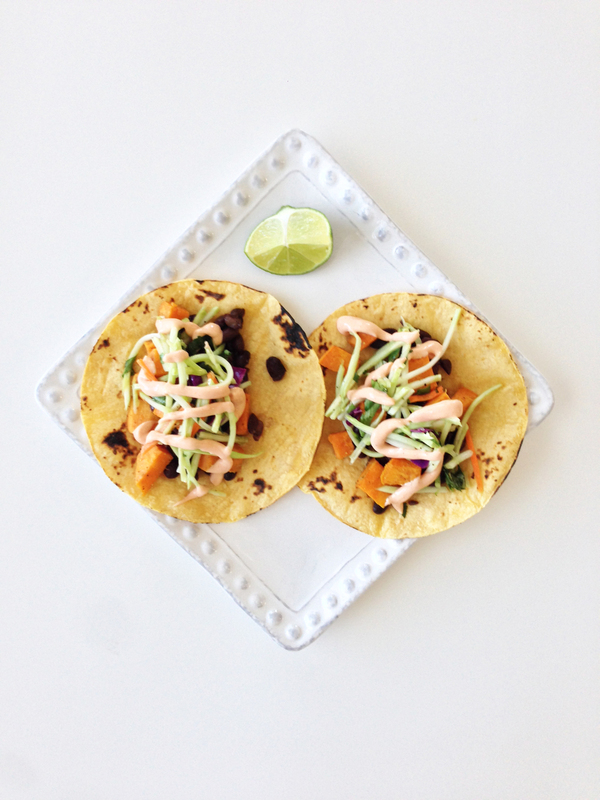 You can throw these tacos together n about 30 minutes for a quick and yummy weeknight dinner. Got leftovers? Toss them in the fridge for a great lunch tomorrow! One reason I chose broccoli slaw is because it holds firm overnight, where as cabbage slaw tends to wilt if it sits for more than a couple of hours. Line a baking sheet with foil and give it a light spray of non-stick cooking spray. Set aside. Peel and dice the sweet potato in 1/2" bites. Toss the sweet potato onto the prepared baking sheet in a single layer. Lightly coat with a little more non-stick cooking spray and sprinkle with some salt & pepper to taste. Bake for about 20 minutes until tender. In the mean time, toss the slaw ingredients together and mix well. Set aside in the fridge. Once the potatoes are done and tender, remove the pan from the oven to cool slightly. 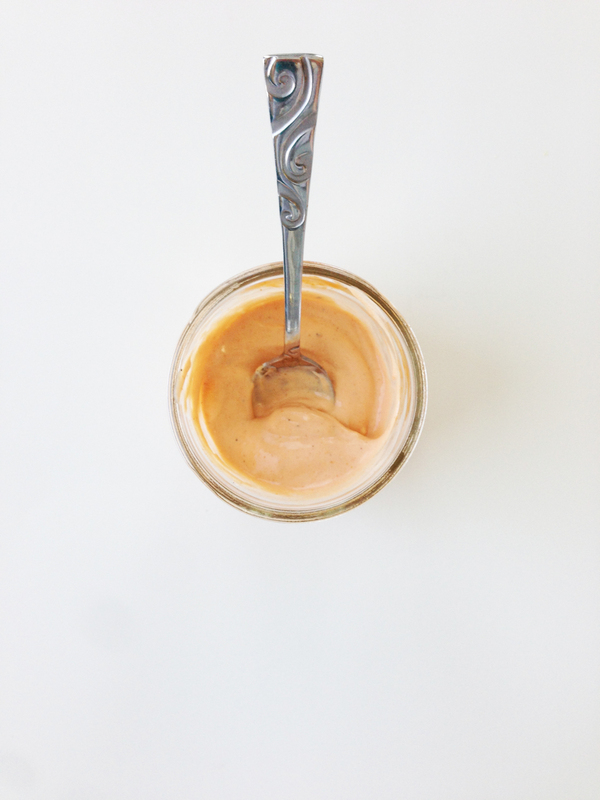 Go ahead and stir up the ingredients for the crema while you're waiting! 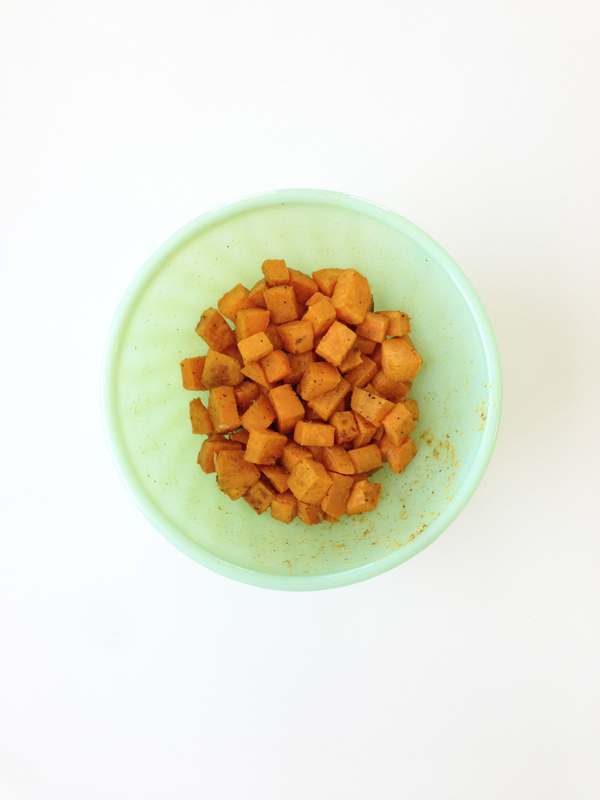 Once the potatoes have cooled slightly, toss them into a medium bowl with cumin, cayenne, and lime juice. I heated mine up for a few seconds over the flame of my gas stove. Top each tortilla with 2 tbsp. black beans and 2 tbsp. sweet potatoes. Finish the tacos off with 2 tbsp. of the slaw mixture and a little drizzle of the crema over the top. Serve warm with a lime wedge and enjoy!